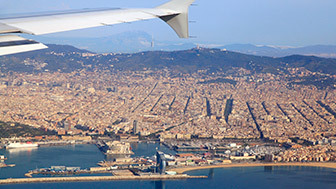 Barcelona would not be Barcelona without its Mediterranean nature: bathed by four kilometres of beaches and flanked by the parks of Montjuïc and the Collserola, an immense green massif with incredible biodiversity, the city offers infinite and irresistible possibilities for experiencing it in the open air. Barcelona has nature on offer all year round. Particularly in the summer, but also for a good part of the spring and autumn, the city's characteristic deep blue skies invite us to bathe in the sun and the sea. There are various beaches to choose from: some are calmer, for families and away from the centre, while others are more crowded and livelier, close to restaurants and party locales. There are also areas for naturists and beaches where you can play volleyball or chuck a Frisbee around. But also, and throughout the year, you can escape up into the mountains to stop at the numerous viewpoints from where you can see the whole city laid out before you, as if it has been made to measure. This is Barcelona: a generous host that offers only the best at every turn. There are green-swathed parks where you can get away from the urban bustle, like Ciutadella, Oreneta, Cervantes, Turó Park, Tres Turons and many others, there are the Collserola woodlands, a sensory spectacle at any time of the year, and there are unimaginable hidden spots, perfect for a picnic with friends or family. On top of this you can see and understand nature in other places in the city, like the Zoo, the Museu Blau natural history museum, the Aquàrium and the Jardí Botànic, the botanical gardens. Ideal for children and anyone else who is still a kid inside. These are the oldest public gardens in the city, created in the 18th century, and they are a perfect mix between a Neoclassical and a Romantic garden. They get their name from the maze with walls of cypress trees, but there are also fountains, a waterfall with a little stream and mythological sculptures. The Jardins de Laribal, which date from the beginning of the 20th century, climb up the Montjuïc mountain as terraces, paths and little squares, pergolas and ponds. The park's waterfalls flow into the historical and popular Font del Gat and this is a good vantage point from which to view the city. In Ciutadella you can walk, row a boat around the lake and relax on the large swathes of lawn. Created in the 19th century, it is an open-air sculpture museum which even has a life-size reproduction of a mammoth. It is very popular with locals and there are always activities being held here. 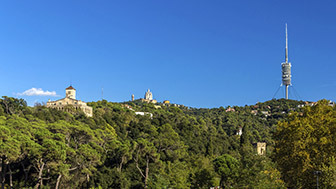 The Collserola massif consists of 8,000 hectares of natural park with an important agricultural past which has left an impression in the form of hermitages, farmhouses and springs. With a huge biodiversity, the park has lush forest, two natural reservoirs, gullies and streams. An icon of the collective consciousness, the Somorrostro beach is very popular with Barcelona residents and great to visit with all the family. It has play areas and shelters, under the porches, a coastal education centre offering beach services to visitors and a biblioplatja, a beach library, in summer. The old fishing centre, today Bogatell Beach, is an ideal place for doing sport. It is 700 m long, has a volleyball area, a beach football pitch, a basketball hoop and table-tennis tables. If you want to relax, there are also parasols and sun loungers. A little hill protects the 500 m long naturist area and its faithful public on Mar Bella Beach. Near the groynes is a kids' play area and space to play volleyball. It is also home to a municipal water-sports centre. Just next to the Port Olímpic, Nova Icària Beach is very popular with Barcelona residents, who usually go there with their families or friends, because, even though it is in the centre, it is very relaxed. There is a good range of sports activities on offer and you can hire parasols and sun loungers. Is a light and calm garden which opens like a balcony over the city and the port. It is built on four different levels that rise smoothly up the slope by means of staircases and little ceramic-tiled squares, and also has a pond with a waterfall. Is a continuous viewpoint, running across the Collserola range from end to end on the seaward facing slope, and it offers wide panoramic views of the city. At one end is the Mirador dels Xiprers viewpoint, with vistas across the Barcelona plain and the Llobregat river delta. From the top of the Turó del Putget hill you get another 360º panorama of the city: you can see as far as the Llobregat plain, and even watch the planes taking off and landing at El Prat Airport. The gardens are full of paths and squares, with picnic tables and areas for playing boules. The residents of Eixample have their own beach in the Torre de les Aigües garden, a landscaped interior patio. The swimming pool, only half a metre deep, guarantees a safe swim for the little ones, and the sandpit is an ideal place for building ephemeral constructions, bucket and spade in hand. This open-air, salt-water pool is located next to the Fòrum's solar panel, and is deep enough to dive into. A hydraulic chair helps wheelchair users take a dip. But there is no sand, the surrounds are paved: a true solarium. Known as the Can Dragó lake, this is the biggest swimming pool in Barcelona: 3,000 m2 of water with various depths. It is surrounded by 12,000 m2 of natural lawns, and it is difficult not to find a place to put your towel down and read, sleep, or simply sunbathe. Picnic tables in the middle of a Mediterranean wood, in the sun or in the shade, and extraordinary views of the port. A great reward if you get there on foot. To the side is hidden La Caseta, one of the few places in the city you can see the sunset from. Parc de l’Oreneta is a true Mediterranean wood, 17 hectares in size, which creeps discretely into the city. At the highest point there is a picnic area with tables in the shade of a carob tree and spectacular views of the whole city. Children can also ride on ponies and have a ride on the steam train. Parc de la Trinitat hides some surprises: around 15 barbecues where you can roast meat and fish and a large picnic area with tables and benches. The park has a crystal clear water channel, a poplar wood, a huge lawn for relaxing on and various different sports courts. The botanical garden is a leader in the conservation of Mediterranean flora. The plant collections are exceptional. Shaped like a huge amphitheatre with steep slopes and more than 1500 species of plant on show, it also offers magnificent views of the coast in the background. The main exhibition at the Museu Blau natural history museum, "Planeta Vida" (Living Planet), takes you on a journey through the history of life on Earth. You can see real gems from the collections that were housed in the Museu de Ciències Naturals for over 200 years. Inaugurated in 1892, Barcelona Zoo is dedicated to research on and conservation of wild fauna. It is inhabited by 400 species, and there is also a farm with domestic animals. This is where an icon of the city, Floquet de Neu (Snowflake), the only white gorilla known until now, lived and died. The oceanarium which is the Aquàrium de Barcelona is unique in Europe. With 4 million litres of water, it is home to sharks, which can be seen up close thanks to the 80 m long transparent underwater tunnel. There are 35 tanks containing 11,000 individuals from around 450 marine species. Barcelona is an open, cosmopolitan city, where social cohesion is a reality. 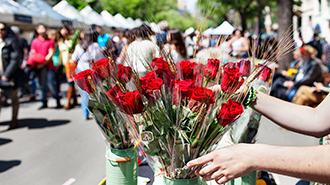 Barcelona hosts countless cultural, social and festive events.